Temple of Artemis is one of the 7 wonders of the world and the first marble temple of the Ancient world. Like all the other Artemis temples it was faced to the west. The Temple was designed and constructed in 6th c. BC. Early construction was built at the expense of Croesus, the wealthy king of Lydia. The rich foundation deposit of more than a thousand items has been recovered: it includes what may be the earliest coins of the silver-gold alloy, electrum. Marshy ground was selected for the building site as a precaution against future earthquakes. The temple became a pilgramage site and tourist attraction, visited by merchants, kings, and travelers. Many paid homage to Artemis in the form of jewelry and various goods. The temple was a widely respected place of refuge, a tradition that was linked in myth with the Amazons who took refuge there, both from Heracles and from Dionysus. The temple of Artemis at Ephesus was destroyed on July 21, 356 BC in an act of arson committed by Herostratus. According to the story, his motivation was fame at any cost, thus the term herostratic fame. That very same night, Alexander the Great was born. A noble Ephesian remarked that Artemis was too busy with Alexander's delivery to save her burning temple. Alexander later offered to pay for the Temple's rebuilding, but the Ephesians refused. Eventually, the temple was restored after Alexander's death, in 323 BC. This reconstruction was itself destroyed during a raid by the Goths in 262, The Ephesians rebuilt the temple again. Following the next two centuries, the majority of Ephesians converted to Christianity. In 401, the temple was finally destroyed by a mob led by St. John Chrysostom, and the stones were reused in construction of other buildings. Including the Church of Hagia Sophia located 450 miles north of Ephesus in the city of Constantinopolis (Istanbul today). Some of the green columns located in Hagia Sophia originaly belonged to the Temple of Artemis. 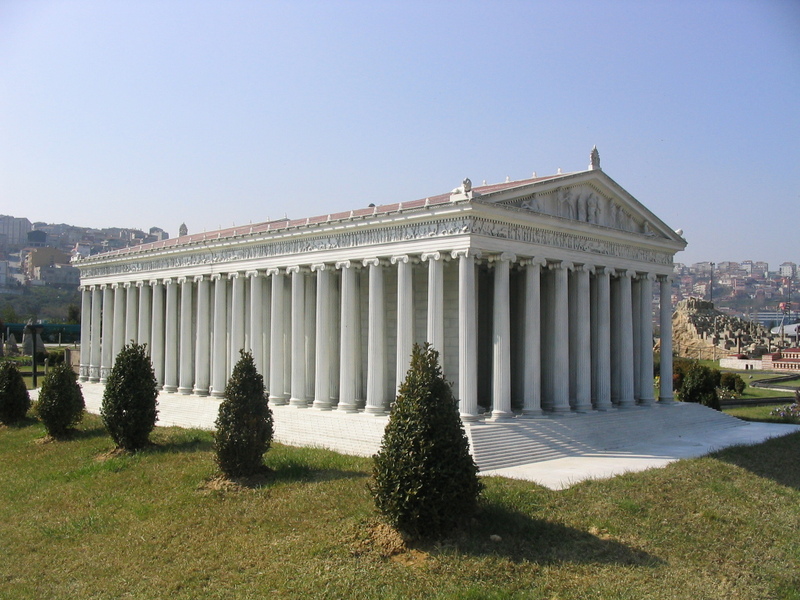 Most of the physical description and art within the Temple of Artemis comes from Pliny. A traveler who travelled through Anatolia, Greece and North Part of Africa in the 3rd century BC. He wrote a book describing the 7 largest buildings of the ancient world and named them as the "7 wonders of the ancient world". Pliny described the temple as 377 feet long and 180 feet wide. As large as a soccer stadium and made almost entirely of marble. The Temple consisted of 127 Ionic-styled columns, each 60 feet in height. The Temple of Artemis housed many fine artworks. Sculptures by renowned Greek sculptors adorned the temple, as well as paintings and gilded columns of gold and silver. The sculptors often competed at creating the finest sculpture. Many of these sculptures were of Amazons, who are said to have founded the city of Ephesus.The Temple of Artemis was located at an economically robust region, seeing merchants and travellers from all over Asia Minor. The temple was influenced by many beliefs, and can be seen as a symbol of faith for many different peoples. The Ephesians worshipped Cybele, and incorporated many of their beliefs into the worship of Artemis. Artemisian Cybele became quite contrasted from her Roman counterpart, Diana. The cult of Artemis attracted thousands of worshippers from far-off lands. They would all gather at the site and worship her. Shortly after 400 A.D. this huge temple, extolled as a "Wonder of the World", was destroyed, and a Christian church appeared in its place. Around the middle of the 6th century A.D., the Byzantine Imperial couple Justinian and Theodora erected a seven-domed basilica on Ayasoluk, dedicated to Hagios Theologos John, above an older church building and the tomb of this saint, considered to be the author of the biblical apocalypse. From the 9th century on, the Bishop of Ephesus also resided here, inside the now-fortified settlement; after this, the vast city in the plain was abandoned. Artemis was the Greek goddess, daughter of Zeus and Leto, the twin sister of Apollo. Believed to be born in Ephesus. She was the goddess of fertility and birth. Many breasts which are considered to be Bulls testicles of her denoting her fertility. The Greek Artemis was dressed in a long garment, holding a bow and arrows like her brother Apollo, which killed the pregnant woman. Each year in spring a feast was organized dedicated to Artemis. During the feast days, there were live sacrifices, athletic games and speech competitions. The feast was also a national holiday for the Ionians of the Asia Minor. Today Temple of Artemis is awating attention from the Turkish government. There is no protection around the temple. Visitors see only a column which has been re-erected by the Austrian Archaeologists. It is a spiritually important site. You would see 3 different religions meeting in the same block. A pagan temple, christian church (Basilica of St. John) and a muslim mosque (isa bey mosque).